For the past 11 days the Large Hadron Collider has been running with a 1092 bunch filling scheme adding 325/pb to the total data delivered. Based on an average peak luminosity of 1.13/nb/s this gives a Hübner Factor of 0.3 which is very respectable for this early stage of the run. During this time the beams have been dumped frequently by problems such as software errors that are being rapidly fixed. UFOs have been another major headache. These are thought to be dust particles that fall into the beam. There is so far no sign of their numbers dropping as the beam zaps them up, but the dump thresholds can be changed in the worst hit areas to reduce the number of UFOs that cause a run to be aborted. This means that overall the run efficiency should improve and the expectation should be for a somewhat better Hübner Factor once they settle into the longer run. The first successful fill with 144 bunch injection ran last night. The longer train length means a few more bunches can be fitted into the ring. They just need two long fills with this filling scheme before they can step up to 1226 bunches in each beam, so higher luminosities should be with us soon. The schedule for the rest of the year has been modified to replace the four planned maintenance breaks with just three breaks, but slightly longer in duration. The immediate effect is that the next stop moves back from 16th June to 29th June, allowing more data to be collected in time for the big HEP-EPS conference at the end of July. This week it has been the Physics at LHC conference in Perugia that has been grabbing most attention. There have already been some new limits shown, such as seen on these plots from a talk today on ATLAS top physics by Marina Cobal. The talks on the final day tomorrow are the ones most likely to declare any new observations rather than just exclusions using the 240/pb on offer. Indications from conference notes already released suggest that we should not expect too much. A lot of the talks have not explored beyond the 40/pb dataset from 2010. A pessimist would say that they have concentrated on the best-hope channels for presentations at this conference so the absence of new observations beyond the standard model here means that nothing new is showing up yet. An optimist, however, might say that they have only been able to approve the less interesting searches in the time available. All the best results may be in the places where no new data was shown this week because they will want to wait a little longer for more data to get conclusive results. We wont have long to wait until the EPS-HEP conference where 1000/pb of data should be on the table. Meanwhile the main buzz is about the CDF bump at 150 GeV. Tomorrow there should be a seminar at Fermilab from the D0 group to tell us whether or not they also see the bump. It will be webcast here. Another version of the talk will be seen at PLHC on Saturday. Woit has already passed on a rumour that says the answer will be negative. Even if he is right, this will leave open the question of how the bump seen by CDF can be explained. The results should be consistent so the two groups will need to compare their analysis methods to find out what went wrong. Update 9-Jun-2011: I have checked all of the talks at PLHC 2011. 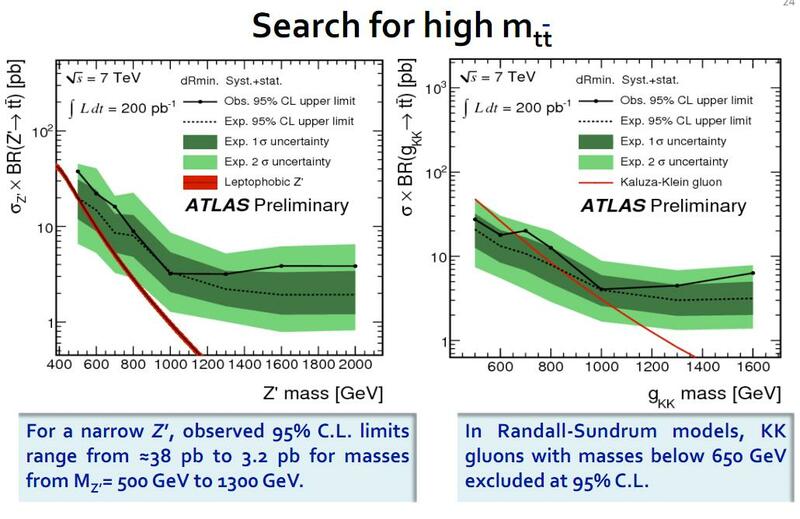 There are 10 talks from ATLAS and one from CMS where new searches using 2011 data up to 236/pb are presented. They all correspond to notes already published last week so we know that only new exclusions limits are found. No new physics is forthcoming this week from the LHC, unless they slip in an extra last minute talk. This entry was posted on Thursday, June 9th, 2011 at 11:20 am and is filed under Conference, Large Hadron Collider, Tevatron. You can follow any responses to this entry through the RSS 2.0 feed. Both comments and pings are currently closed. Isn’t the D0 paper really this one? It uses transverse momentum as the independent variable, not the total dijet invariant mass, but otherwise it’s very similar and they don’t see anything. Otherwise, a good summary, including the optimist vs pessimist description. I was looking at that paper too. They cover the Wjj signal in the energy region of interest and say it agrees with predictions. They don’t refer to the CDF result so it is not entirely clear to me as a non-expert if this rules out the bump, but with 4.2/fb they should also see it too if it is there, right? There are some caveats in there though. If they showed the same plot as CDF it would be more obvious. This could also be on purpose. They could just consider the CDF claim not to be worth talking about at all and the only measurement that makes sense according to D0 could be based on the transverse energy. As they note, the longitudinal energy of the W is surely not measurable because the neutrino’s energy is lost.. They could be implicitly claiming that one shouldn’t trust the longitudinal jet energy, either. that these UFOs are made by dark matter. Indeed, according to Quantum-FFF Theory, Dark matter, the same as Ball lightning, the same as micro Black holes or bunches of massless Higgs particles. Not only the LHC but even the Chilean Puyehue Volcano seem to produce self propelled gas trailing fireballs or Ball lightning. The signature of the UFO events is a bell curve of activity over time with a shape that matches the beam profile. This means that the objects must be small specs of material that continue to interact with the beam as they fall slowly through it. The velocity can be deduced from the duration of the curve and is found to be about 0.4 – 1.0 m/s . 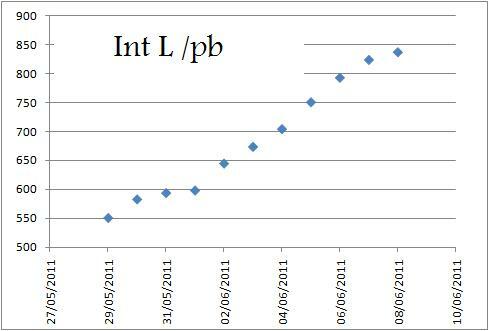 These speeds are consistent with particles that free fall from the top of the pipe until they run through the beam. There is really no way that dark matter could be moving so slowly relative to the Earth given that it should be weakly interacting. Sorry to wipe out such a fascinating idea! Let’s hope during the long break they get in there with a dust mop. Looks as if 1236 x 1236 is on the cards this week with 1/fb being achieved within the next day or two. They are ready for 1236 accept for some problem with RF power that requires “conditioning the couplings” No idea when that will be done but hopefully soon.